The next step, Deputy Chief Minister Sachin Pilot said, is to approach the Central government, appealing for an amendment in the Constitution that would make its implementation possible. Huge protest by Gujjar community affected the road traffic and train services in Rajasthan. 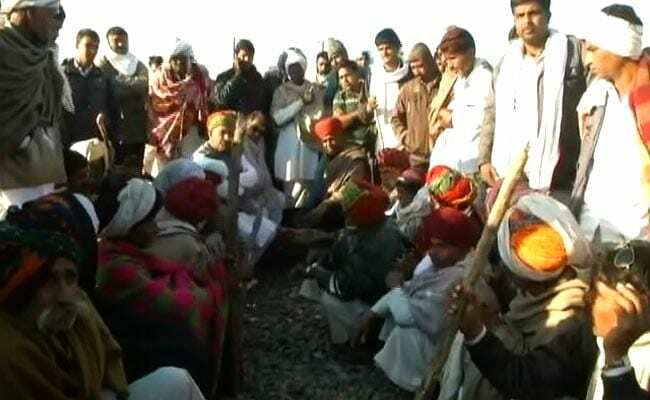 The Congress government in Rajasthan passed a bill earmarking 5 per cent reservation for Gujjars in jobs and education today amid a huge protest by the community, which has paralysed road and rail traffic since last week in parts of the state. The next step, Deputy Chief Minister Sachin Pilot said, is to approach the Central government for an amendment in the Constitution which would make its implementation possible. Rajasthan has already touched the 50 per cent ceiling on reservation placed by the Supreme Court. Tamil Nadu and Maharashtra have crossed fifty per cent quota. Also, parliament has just given 10 per cent quota to the Economically Backward Classes, Mr Pilot pointed out. "We will pass this bill and send it to the Centre, so they can pass it with a Constitutional amendment like they have done in the 10 per cent quota case," Mr Pilot told the state assembly. "We will go meet (BJP chief) Amit Shah when he comes to Jaipur, to ask him to have this passed". Last month, the Centre had passed the bill that provided for 10 per cent reservation in jobs and education for the economically weaker sections in the general category. The bill was introduced as a constitutional amendment, which made the quota legally valid. The Gujjar agitation flared up soon after, with the community pointing out that the Congress had promised five per cent reservation to them in its election manifesto. The Gujjars, who comprise around 5 per cent of Rajasthan's population and are traditional supporters of the BJP, have been demanding quota since 2006. Although covered under the quota for Other Backward Classes, they demanded an extra 5 per cent quota for the community. Efforts have been made twice by BJP-led governments in the state to grant that quota under various heads. But it has been repeatedly struck down by the Rajasthan High Court. The last such effort was made in 2017, when the Vasundhara Raje government gave Gujjars 5 per cent reservation as a Most Backward Class and expanded the OBC quota to 26 per cent. "We know that five per cent reservation has been overturned in the past. But now the circumstances are different," said Mr Pilot. "The Centre has just crossed the 50 per cent limit. The path has been cleared". The Congress has added a line to the Rajasthan Backward Classes Bill that says since the Centre has given 10 per cent reservation to the EWS sections in the General Category, the Rajasthan government proposes 5 per cent quota for the Most Backward Castes, which would include Gujjars and four other nomadic tribes.